Paul Clammer is a travel writer specializing in 'tough' travel destinations. Sharing the island of Hispaniola, the Dominican Republic and Haiti are like two sides of the same coin. Beloved by honeymooners, snowbirds, budget travellers and beach bums, laidback DR is the Caribbean's most popular holiday destination. Meanwhile, what Haiti lacks in tourist infrastructure, it makes up for in fascinating culture, warm locals and a whole lotta adventure! 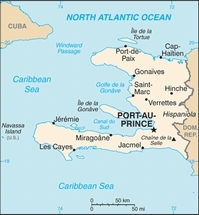 The Dominican Republic and Haiti make up the island of Hispaniola, which is the second largest island in the West Indies, after Cuba. The Dominican Republic is a popular destination as there are several endemics on the island, one of which, the Palm Chat, is in its own unique family. In this book all 302 species known to have occurred on the island are described and illustrated and information on the biology and ecology of the birds is also given. This is the only comprehensive field guide devoted to the birds of Hispaniola, providing new information from the authors' personal research on the biology and ecology of the island's avifauna. This is a valuable addition to the literature of the West Indies. L'ouvrage propose une approche centrée sur des thèmes de la vie quotidienne moderne. Chaque leçon se présente sous la forme d'un dialogue, qui est traduit en français et accompagné d'explications grammaticales et d'exercices. The Dom Rep side was fairly straight-forward to update, as there has been little change, but the Haiti side needed a lot of time and energy. The earthquake revealed a previously unrealized reality - nobody had any information on Haiti. Our map was the only one in existence, and it proved to be too weak to meet the needs of humanitarian groups. They, however, provided a wealth of useful information as they reached out to isolated villages about road conditions, spelling of place names, and actual locations, which we have added to our artwork. This is a work in progress, so don't expect perfection, but this map is far better than anything anyone has ever done for this country previously. We also have a vastly improved inset map of Port-au-Prince, the capital. Double-sided, printed on plastic.